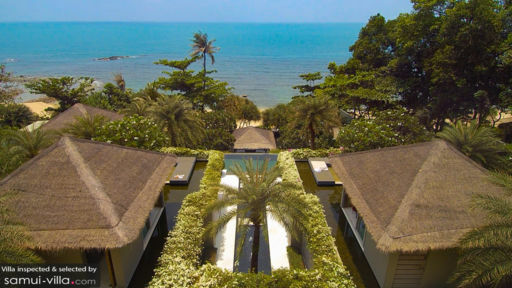 Found in Chaweng, on the shores of Chaweng beach in Samui, Sangsuri Villa Estate is an oceanfront ultimate, luxury, private holiday destination for people who are looking to book villas for an event such as a wedding, birthday etc. With three villas, Sangsuri Villa 1/2/3, there are 21 bedrooms and 4 dormitories which can accommodate numerous guests including children. There is no shortage of amenities at Sangsuri Estate as you will find everything from infinity pools, Jacuzzis, to yoga studios, AV rooms, and tropical gardens with a landscape that includes views of the ocean. Sangsuri Villa 1 is the largest of the three villas and has eight bedrooms and two dormitory that can accommodate children. Each bedroom, including the master bedroom, offers an exciting view of the ocean. The bedrooms are furnished with king beds and have en-suite bathrooms. Sangsuri Villa 2 has seven bedrooms + dormitory and Sangsuri Villa 3 has six bedrooms + dormitory. All the bedrooms are lavishly furnished and some even lead to the sunroof and private terraces. Most bedrooms lead outdoors to the swimming pools as well, so guests can always move around the villas with ease. There are en-suite bathrooms for each bedroom including the dormitories. 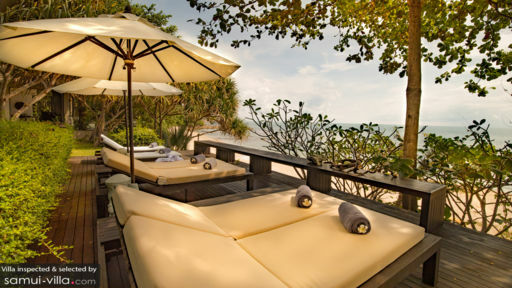 With an invigorating landscape which features lotus ponds, water features, tropical gardens with swaying palm trees, and the ocean glistening under the tropical sun, Sangsuri Villas offer a truly remarkable place for guests to rejuvenate and refresh themselves. There are four swimming pools in all the villas combined thus, you get to savor the view from the infinity pools as much as you wish. You will also find that they have Jacuzzis outdoors along with gardens that have projector screens for an outdoor cinema! All three villas have a ‘beach level’ that leads directly to sandy shores of the beach out front, where you can take out the kayaks and paddleboards for a fun experience! Sangsuri Villa Estate prides itself in offering the best of everything to guests and that too in abundance. There are over four living areas in the three villas altogether, so you can rest easy, and lounge on the comfortable sofas. The décor is quite contemporary with clean, minimal décor featuring white interiors. There are beanbags and such overlooking the pool and the ocean. The living area in the first two villas are both indoors and outdoors, whereas Sangsuri Villa 3 has an open-concept living area. Similarly, there are alfresco and indoor dining available to guests, so they can enjoy dining under the stars or inside the cool ambiance of the living spaces. Additional space can be converted into a breakfast corner or cocktail bars. The kitchens are exceptional in that they are fully-equipped, resort-style kitchens with all the amenities and appliances that you could need. There are yoga studies and AV rooms, massage salas, and other services available to guests of the villa. Apart from the individual services provided by the villa staff to the guests, Sangsuri Villas Estate also offers guests access to a multi-purpose gym that can be used by all the guests, kayaks and paddleboards to use on the beach, as well as many excellent services. There are in-villa chefs to prepare delicious meals and whip up a BBQ delight too. 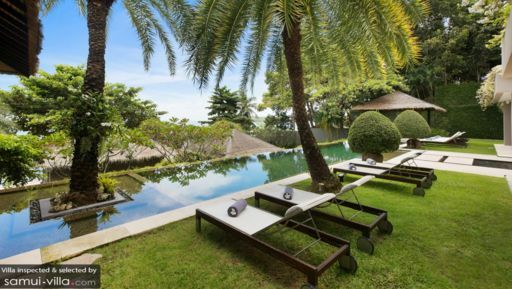 Located in Chaweng beach, the guests of Sangsuri Villa Estate can roam around the area exploring a plethora of restaurants, bars, and cafés. There are other activities like water sports that can be engaged in. Head to Choeng Mon beach and the Night Market for an easygoing, relaxing day out with friends and family. Sangsuri villa is just 5 minutes away from the airport. The villa right next to the main road, you need to know where it is located or you will just zoom pass it. Upon entering the villa compound (small drive way in villa 3, you may have to back out your vehicle if Villa 2's door is closed), you will see a rock stair case leading to the first landing which has 3 bedrooms. The second landing leads to the living room, dining room, av room, pool, kitchen and master bed room. The next landing leads to the 5th bedroom, spa gazebo, jacuzzi (that fits 8-10 people) and the beach. The villa is very nice, modern and perfect for our group of 9 adults and 3 kids. It is an outdoor style villa with each area compartmentalize. The pool and dining room became the central attraction for the family the entire trip. Food served by the in-house chef was delicious and authentic. In house villa manager proposed suggestions for our meals and everything just came out perfect including the food presentations. Villa is about a 15 minute drive to Central Mall. Definitely recommend to rent a vehicle during the stay for convenience if you plan to venture out. Service provided by Sangsuri Villa 3 staff was perfect and exemplary. They paid attention to our every needs and also proposed suggestions to improve our stay. From the time we arrived to the time we departed we were catered to extremely well. A big thank you to Preaw (Villa Manager), Chef Max (chef), Bill, Ms. B and Duew for the wonderful experience and service you provided to our family. Booking of the villa was also very convenient, Oliver the reservations officer replied within 24 hours (most cases within 12 hours) and accommodated all our queries and answered our concerns and most importantly met all our requests before our arrival. The only few issues that we came across that was by no fault of the villa, staff or management are the staircase and mosquito. The staircase can be kind of steep for older folks and infants. Lighting is provided at night but kind of hard to see for the older generation. There are no handrails provided for both staircases leading into the property. Bring mosquito repellents as there are plenty of them. The beach does not have white sandy beach, lots of small rocks and pebbles. Recommend to bring / wear reef shoes. Also the sea is shallow for about 50m and full of reefs and rocks, do not recommend to venture out too far with young children. The villa provides kayaks that you can use to go out to sea, better if you are an experience kayak-er. Overall, the entire trip was excellent; everyone came and left rejuvenated. Villa location is very centrally located, service provided by management and the villa staff were above and beyond. Would definitely come back again!! Thank you all for the wonderful time and experience. We were amazed by staff, villa facilities and the fantastic views from the moment we arrived at Sangsuri Villa 1. All staff member are very friendly, professional and well trained, facilities are clean, modern and have recently been upgraded, the sea view is simply breathtaking. The 22m pool, the massage beach-sala, the direct access to the beach and the large lawns and other sports and leisure facilities contributed to an unforgettable holiday. We will certainly be back in the not too distant future! We stayed at Sangsuri villa 1for 8 days, this villa was lack of proper maintenance, lots of problem start from no hot water in most bedrooms, swimming pool never cleaned, we have to complaint several times to get it clean (from their own staff due to their contractor couldn't be bother to come) sewage smell lingered from all bathrooms. Mosquito swamps around bedrooms, we requested the management to attend to, staff emptied the swamp but never have time to refill the ponds until we left. Satellite TV never worked, lists go on..The owner plans to renovate in the future, shouldn't let it out with this conditions. One of the walk path between the 2nd & 3rd bedrooms was the uneven step, my youngest son, scuba diving teacher & my husband tripped over several times, no one attended to fix it. We mentioned all these issue to villa manager, she tried to fix some problem but nothing much she can do, we are not happy what we paid for this price, not recommend to anyone who looking for the luxury villa at this price tag. We had our wedding ceremony at this villa, and my wife and I stayed there for 4 nights with our family (11 people in total). - good location: quiet but very convenient - good condition with modern decoration: the photos here pretty much reflect the true picture - good design: the villa's bedrooms, living/dining room, facilities and the lawn are spread out over different layers, we find this very special and love it - large space: in addition to an infinity pool, the villa has a private and spacious lawn area (can easily hold 5 tables and a dancing area), and a semi-private beach, excellent spot for sunrise (the sand is not soft at all through) - good food: the villa has an onsite chef, you can order pretty much whatever you want and the chef will shop and cook in the villa, very fresh and delicious, and you may bring your own wine without any corkage - generally good service: not the best but the team is helpful and very nice We had a very memorable wedding, and we all enjoyed our stay at the villa very much.